This year the VacWork theme centred around speed. 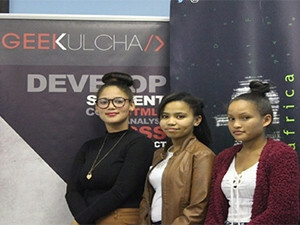 The Northern Cape Department of Economic Development and Tourism (DEDAT), in partnership with youth organisation Geekulcha, recently hosted the Geekulcha VacWork programme at Rietfontein Mier in the Northern Cape province. The Geekulcha VacWork programme is a vacation skills development programme that brings together 50 or more high school pupils over the school holidays to learn about the latest tech trends. The programme specifically focuses on mobile app development, Web development, entrepreneurship skills and electronics and design. It aims to encourage youth to venture into the ICT field to increase work opportunities within the sector. Geekulcha co-founder and COO Tiyani Nghonyama says: "The programme was a success and it was great to see youngsters from the Northern Cape develop groundbreaking innovations. To make the programme a success, teams from the DEDAT, business development social enterprise DCVH and Geekulcha, were brought on board to run the activities. All members played their roles as intended, while some used this as an opportunity to learn new things, especially around entrepreneurship." Supported by mLab Southern Africa, the Shuttleworth Foundation and the Diamond Creative Vision Hub, the Geekulcha VacWork programme takes the scholars to a real and co-creative working environment to get them trained while helping them to build ICT projects with the assistance of mentors, he adds. "This year the programme was hosted in line with SkateHacks, an initiative established by DEDAT and Geekulcha to attract young people into the fields of science and technology. As the VacWork theme was centred on speed, we decided to integrate the component of the initiative with the skateboarding competition. "The youngsters were challenged to put technology into a skateboard to come up with creative ideas around speed and bring about safety into skating. A tech debate was also curated for the youngsters to engage in various discussions on topics ranging from social media, digital currency to artificial intelligence and others," notes Nghonyama. As part of the innovation challenge, the scholars had to design a digital innovation solution that would benefit the community of Mier. Various solutions were developed by the participating teams such as app solutions to boost tourism, and digital platforms to provide access to services. First place: Young Intelligent Ones - They aimed to develop a mobile app to guide people about tourist sites and activities in Mier. The app will showcase Mier and boost tourism in the Northern Cape. Second Place: Mier Sport League - They are introducing a Web platform to market potential sports talent in the town. Third place Team TACU - Teenagers against Crime and Unemployment: They raise awareness about crime hot spots in Mier, using a GPS map to lay out the areas and identify them as danger zones.